Dermatographism means "writing on skin," but it has nothing to do with tattoos or felt tip markers. Rather, it's a skin condition in which even a small amount of pressure triggers urticaria, a raised rash also known as hives. 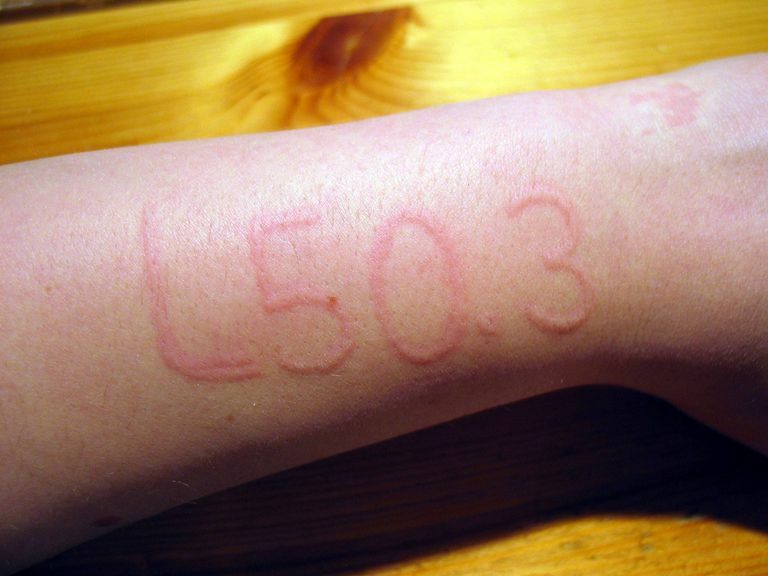 If you were to gently use your finger to draw invisible lines on the arm of someone with dermatographism, the marks would show up as a red, raised, itchy rash wherever you touched her skin. This odd skin condition isn't serious, and most people who have it aren't bothered by it. Even so, there are ways to treat and prevent it that are worth knowing about. Around 5 percent of people live with dermatographism. For most of them, rashes materialize on the skin within five to seven minutes of being touched. After 15 to 30 minutes, they usually disappear. In rare cases, a rash caused by dermatographism will take longer to come up and also will last longer. Doctors are not sure why dermatographism occurs. It may be a true allergy, meaning that allergic antibodies are present in the body that cause the reaction. Even if this is the case, it's not known what those antibodies are responding to. Another explanation is that the immune system is releasing too much histamine—the substance that causes allergic reactions such as sneezing, wheezing, welts, and hives. Other possible reasons for the rashes is that they're a reaction to infection, a medication such as penicillin, or even being emotionally upset. If you think you might have dermatographism a dermatologist will be able to diagnose you very easily simply by stroking an area of skin with a tongue depressor or pen. If a rash appears, then in all likelihood you have dermatographism. Once you've been officially diagnosed, you may choose not to do anything to treat your rashes if they really don't bother you. If your symptoms are severe, however, your doctor may recommend you take an antihistamine medication such as Benadryl (diphenhydramine), Allegra (fexofenadine), or Zyrtec (cetirizine). Keep in mind that many of the most effective antihistamines for dermatographism are sedating; however, some non-drowsy formulations may work for you. Steer clear of skin irritants. Harsh soaps, clothing made of itchy materials such as wool, and hot showers and baths all can make the symptoms of dermatographism worse. Keep your fingernails to yourself. Scratching your skin will aggravate dermatographism. Make sure your skin stays moisturized. When it's dry, it tends to itch and so you'll be tempted to scratch (see the previous tip). The best time to moisturize is right after you shower or bathe, while your body is still damp. Slathering on a thick skin cream will help lock that moisture into your skin to keep it supple and itch-free. American Osteopathic College of Dermatology. "Dermatographism." Mayo Clinic. "Diseases and Conditions: Dermatographism." Sept 4, 2015. Is Your Occupation Causing a Weird Skin Rash?